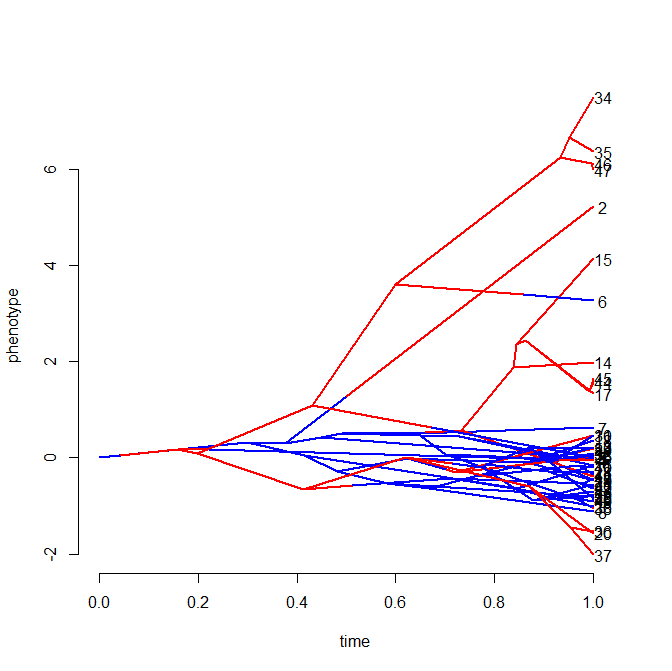 I recently added a function to phytools called fitBayes for fitting evolutionary models with intraspecific variability. 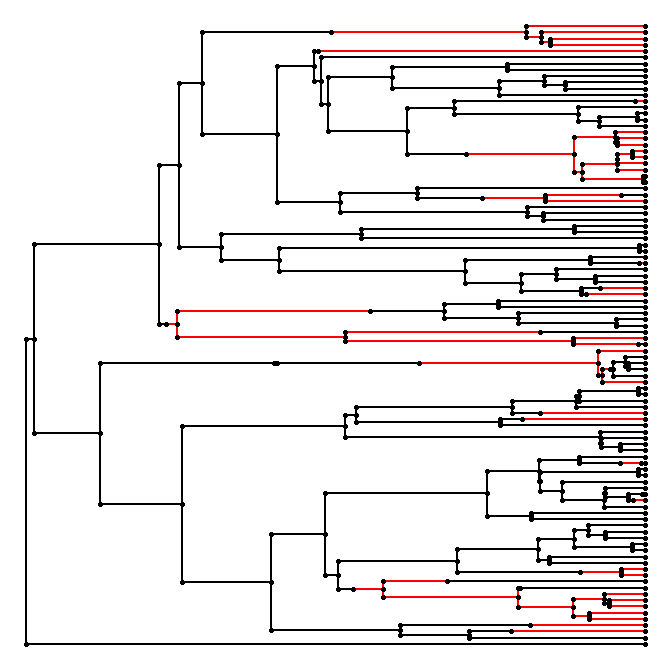 It is in version 0.1-5 (and higher) of the phytools package, and I also just posted the code to my R phylogenetics page. Note that multiple functions are required to run this analysis so it is probably better to just download the phytools package (latest nonstatic version here). The function takes as input a species phylogeny and a vector of data for one or multiple individuals per species. It then simultaneously samples species means and variances, as well as the parameters of the fitted evolutionary model (presently BM and the λ model). The neat thing about this method is that the tree and evolutionary model can influence the estimated species means (as well as the reverse). In theory (and in simulations) this leads to more accurate estimates of the means for species than when the phylogeny is ignored. I'm not going to go into great detail about this function - I have a submitted manuscript in which Graham Reynolds (presently a postdoc in my lab) and I describe the approach - however I have posted a little demo, with explanation, below. Here, at least, taking the tree and evolutionary model into account means we also get much better estimates of the species means. Neat. To do some simulations for the project that I'm working on, I needed to do some Yule (pure-birth) tree simulations, fast. 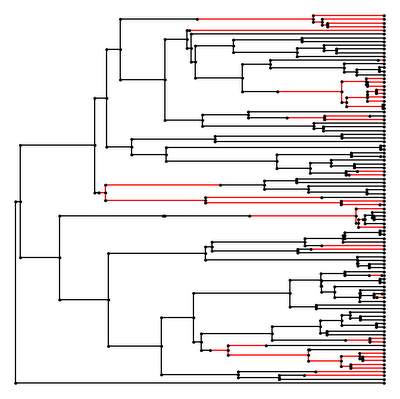 The geiger package has a great function, birthdeath.tree, that I would normally use - but since this function does birth-death tree simulations, for large pure-birth phylogenies it is slower than it needs to be. I have just posted a new phytools function, pbtree, that does pure-birth tree simulations pretty quickly. Presently, it only simulates for a fixed number of tips; but it will also rescale the tree to have an arbitrary total length. 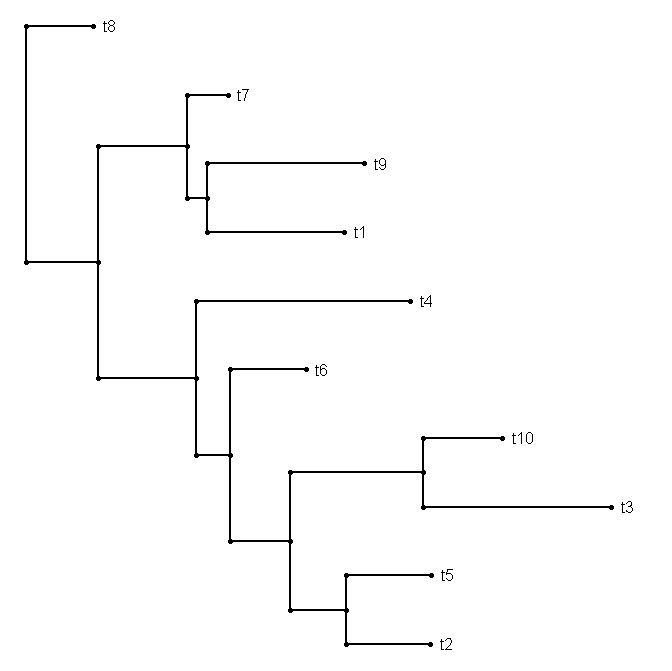 Finally, it stops at the nth speciation event (for n taxa), rather than at the (n-1)th event, which is nice because it means that the branches descending from the last speciation event do not have length zero. A direct link to the code for this function is here. I have also included the function in the latest, non-posted, non-static development version of phytools (you can download it here and install from source). The function was simple enough to write. Basically, the way it works is it first calculates the number of edges in a pure-birth tree of size n. Then, it iterates up from the root of the tree. 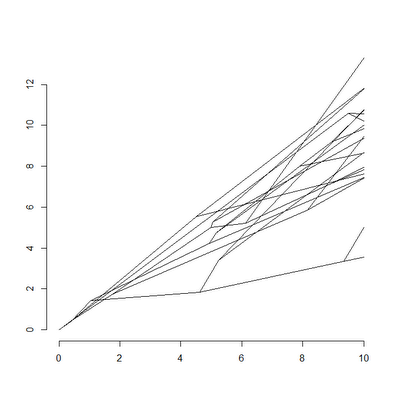 Each time an edge is to be added, it first draws a random value from an exponential distribution with mean m/b, where m is the number of species currently extant at the time of addition; and b is the birth-rate. It then adds the edge at the end of a randomly chosen edge that does not already end in a bifurcation. I kept track of this by adding new rows to $edge with the convention that the tipward end of that edge was labeled NA until a descendant was attached. 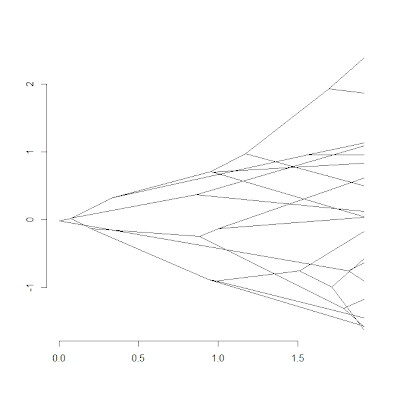 In addition, the new random exponential edge length is added not only to the parent of the new edge, but also to all "open" edges on the tree (that is, edges that have not been closed by a bifurcation event). Also in the phytools version linked above is a new version of evolvcv.lite which also returns the numeric value for convergence produced by optim. I've never been a huge fan of birthday celebrations, but in keeping with the fact that I normally prefer the birthdays of others to my own, I thought it was time to make note of the (unofficial & approximate) one year anniversary of the phytools blog. Although I had created a couple of earlier preliminary posts, it was exactly one year ago tomorrow that I wrote my first serious phytools post (a description of the first version of read.simmap), and it was exactly one year ago Sunday (yes, Christmas day 2010) that I first advertised the existence of the phytools web-log via the (once quite popular but now largely defunct) dechronization blog. The past year has been a good one. The blog has received a little over 30,000 pageviews in that time span, which means it has managed to accrue an average of over 80 pageviews per day for the year. In many months, that average has been over 100/day. The interpretation of the number of pageviews per post is a little bit fuzzier because (unlike some other blogs such as Anole Annals) it is never necessary to click on a specific post to read the whole article. This tends to skew the pageview/post count towards posts that have received comments, as to view comments it is necessary to click through to the post. Nonetheless, the clear leader in this tally is a post I created describing a function (allFurcTrees) that would generate all possible multi- and bifurcating trees for a list of taxa. I created an animation of this treespace and it was picked up by, of all places, an art-in-science blog penned by Jessica Palmer called "Bioephemera" (link to her post here). 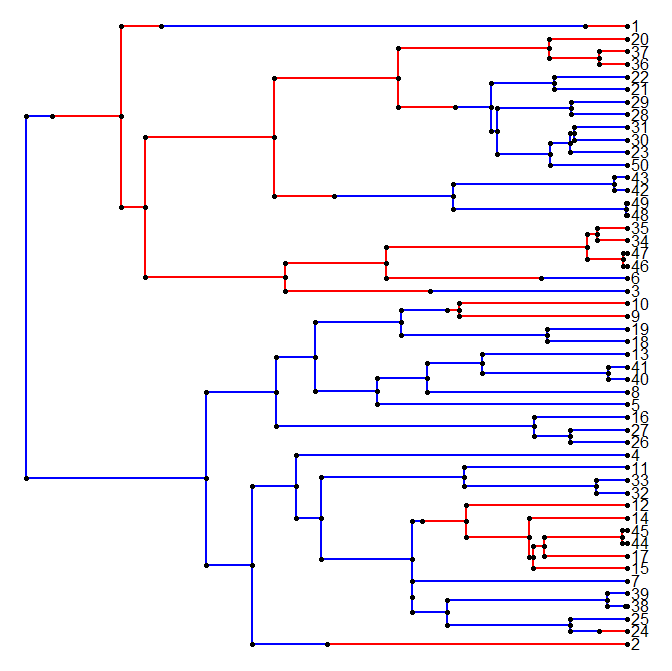 Other very popular posts on the "all-time" list include an article about my function phylosig to compute phylogenetic signal (here), a post about least-squares phylogeny estimation to which Joe Felsenstein was kind enough to add his comments (full post here), and, most recently, a post about a new phytools function, anc.Bayes, for Bayesian ancestral character estimation (here). In acting to some degree as an open lab notebook, where I document (nearly) every bug, modification, or update to the phytools package, I feel that the blog has helped to keep me honest, accountable, and productive. It has also served as a good forum to get feedback on the phytools package (although sometimes not as much feedback as I'd hoped, e.g., witness my totally failed comments page). Here's to another year of phytools! Thanks for reading. After musing about doing so during my phytools phyloseminar (recorded here), I have just added the capacity to show a mapped discrete character trait to the new function phenogram. 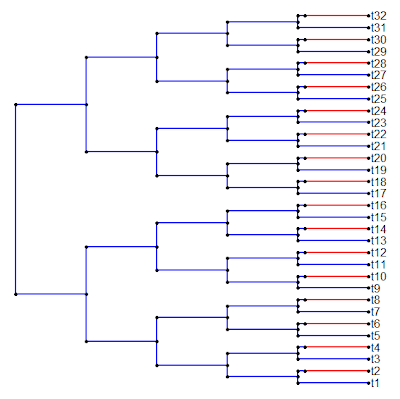 This could be a very neat way of, for instance, visualizing a change in the evolutionary rate or selection regime on some of the branches of the tree (although it will normally rely on ancestral character states estimated under a constant rate Brownian model). The trick in doing this was not coloring the lines (that's trivial), but in mapping adjacent segments of the same branch. 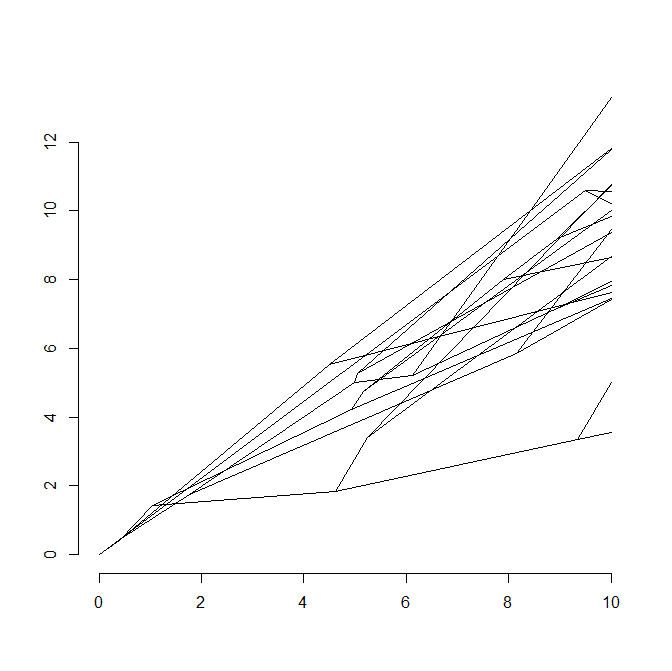 To do this, I first computed the slope of the entire branch (in this case, the change in phenotype over the change in the height above the root node), and then I used this slope, the length of the mapped segment, and the starting phenotypic trait value at the parent node to plot each line segment for each mapped state. Direct link to this new version of the function is here. The traitgram, in this case, includes the known states at internal nodes and clearly shows the difference in rate between states. If the ancestral values were not known & provided, they would be estimated using ML. I just wanted to make a quick comment on my recent update to the phytools function plotSimmap() which now allows it to plot both "phylo" and "multiPhylo" SIMMAP style trees. As a preliminary, an object of class "multiPhylo" is just a list of "phylo" objects with class(...)<-"multiPhylo". To see that this is true, just make a list of "phylo" objects, set the class to "multiPhylo", and then apply any function that accepts "multiPhylo" objects to this list. Thursday December 15 was a banner day for the phytools package as in addition to my phytools phyloseminar, and unbeknownst to me until know, Methods in Ecology and Evolution has just published the phytools manuscript "Early View" (i.e., corrected proofs in advance of publication). Check it out (! ); and please don't forget to cite this article when you use the phytools package in published research. Readers of this blog won't learn anything new from this talk (or at least my component thereof), but my "phyloseminar" with Klaus Schliep about R in phylogenetics, focusing specifically on phytools and phangorn, is now available as a recording online: phyloseminar recorded talks. The new function is the simple plotting function phenogram(), which is a lot like traitgram() in "picante", but can also take the internal node states or estimates, as well as the terminal states. 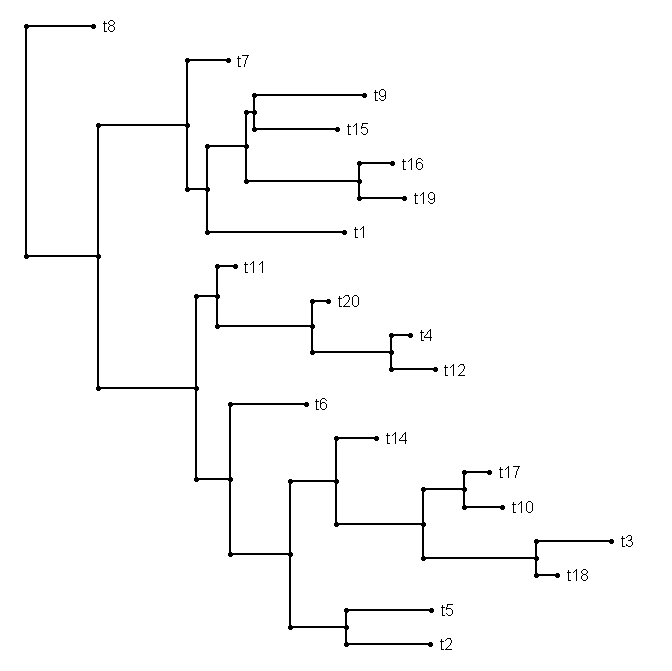 The idea is really simple: we just project the phylogeny into a space defined by phenotype (in phenogram() this is the ordinate) and time (on the abscissa). This is more or less the same as you'd get with traitgram in the picante package. 1) plotSimmap() can now handle "multiPhylo" objects, in which case you just advance through the trees by hitting ENTER or clicking on the plotting window. 2) sim.rates() can now return the states for internal nodes as well as the tips of the tree. As noted above, you can also a new test release of phytools containing these updates here and then install phytools from source. The above error message is typical of trees with terminal branch lengths of zero length. 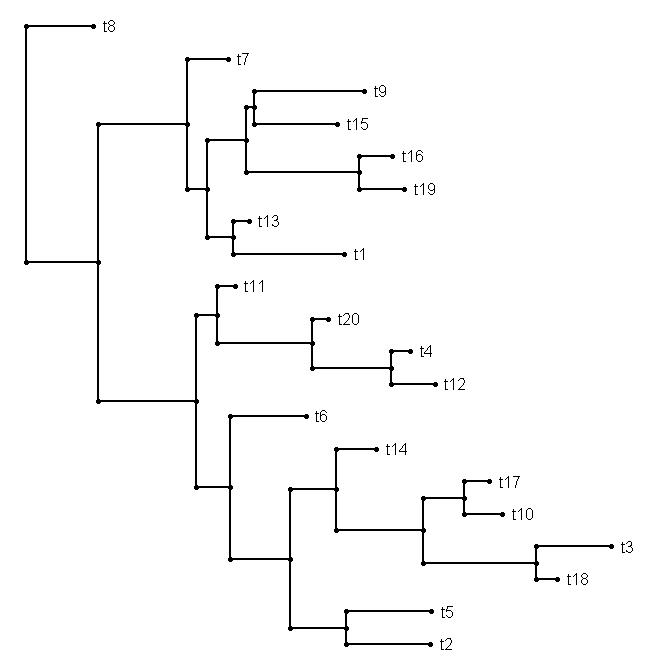 This is because if two terminal taxa from an internal node have zero length branches, then the matrix vcv.phylo(tree) is singular (i.e., it has a determinant of zero and cannot be inverted). However, in the case of this user's dataset and tree, this was not the problem. This led me to suspect that the problem resulted from very low rates along some branches of the tree which resulted in a among species covariance matrix that was singular to numerical precision. In fact, this seems to have been the case as the fitted evolutionary rates are indeed extremely small along some of the branches of the phylogeny. 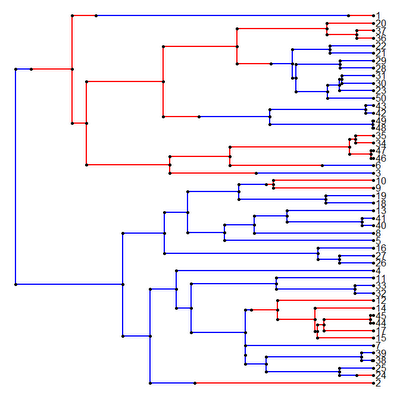 A user just inquired as to whether there was an easy way to compute phylogenetic signal across multiple trees (say, a set of trees sampled from the posterior distribution or a set of equally parsimonious trees). In fact, this is quite easy. To illustrate this, I will first simulate a set of 10 trees, and then I will generate data on one of these. This is intended to replicate our typical data analysis pipeline in which we have multiple trees but one vector of phenotypic trait values for species. 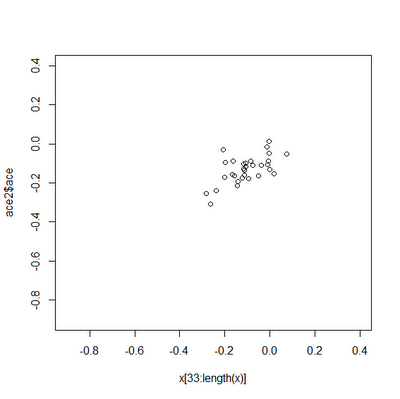 If we are reading data from file, x should be a vector with the phenotypic trait values for species in which names(x) contains the tip names in the tree. 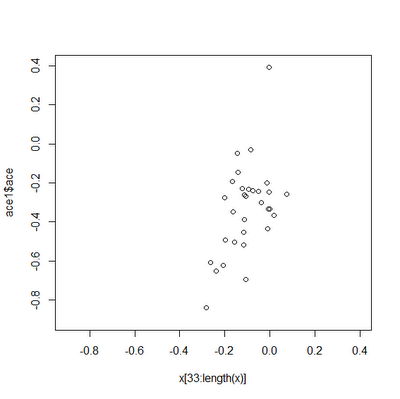 Now, we can use the base function sapply() to get a vector of K values for each tree in our set (of course, in this example, all the trees except the 1st are random with respect to the phenotypic data in x). Hi all. 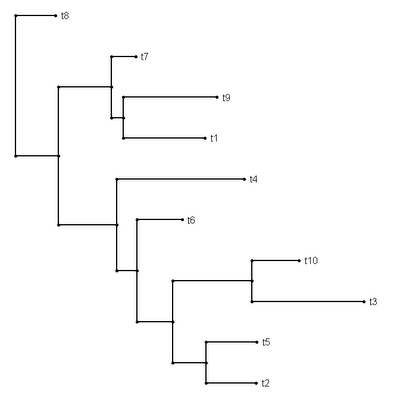 I just wanted to post a quick announcement that Klaus Schliep, author of the phangorn package, and myself will be giving a phyloseminar (that is, a participatory web seminar on phylogenetics: http://phyloseminar.org) one week from this Thursday, on Dec. 15th. The talk will start at 2pm Eastern, earlier or later in other time zones, and we are splitting about an hour long session including questions. I will both be talking about new methods as well as demonstrating the use of the phytools library in R. I hope some of the readers of this blog will attend! Dave Bapst kindly pointed out that the function anc.ML() will fail if there are any zero length internal or terminal branches in the tree. For zero length tip edges this is unavoidable because the determinant of vcvPhylo(tree) for this tree will always be zero. However, for zero length internal edges this can be avoided by first collapsing these using the ape function di2multi(). Unfortunately, anc.ML could not handle these trees because it uses pic() to estimate a starting value for the evolutionary rate, σ2! Fortunately, I have resolved this by way of a couple of fixes. 1) The function first checks if the tree contains any zero length edges. If it does, then anc.ML will return an informative error message. 2) If the tree does contain polytomies, then pic() will be called on an arbitrarily resolved tree (using multi2di). The new version of this function is available here. by which I take it to mean they'd like to drop a random tip (or set of tips) from a "phylo" object in R.
and imagine that the rate of evolution is very low [say σ(blue)2=0.01] on the blue branches of the tree, and very high [say σ(red)2=1.0] on the red branches. 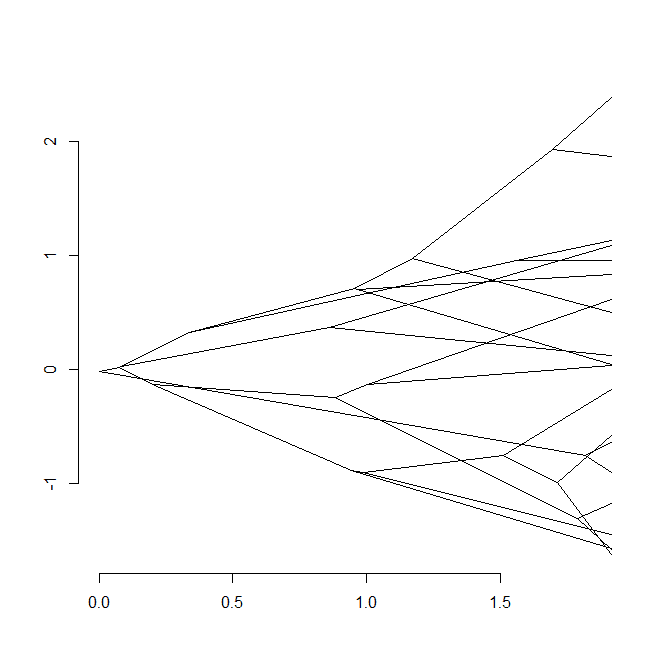 Under this scenario, the states at the internal nodes of the tree will be much closer in value to the state at the root node than they will be (on average) to any red tip. We might like to take this into consideration in estimating ancestral character values. To show this, let's consider the following example. 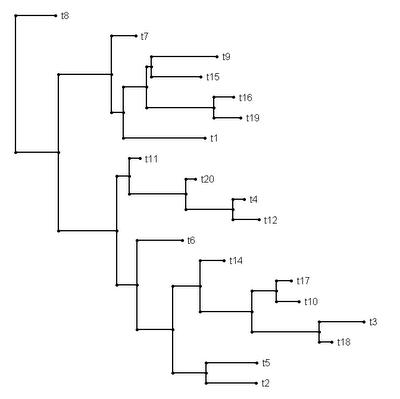 First, let's simulate data on the tree by first stretching the branches of the tree by their rates of evolution, then by using fastBM(). Here I use fastBM() rather than the much easier phytools function sim.rates(), because fastBM() allows us to return the states at internal nodes. 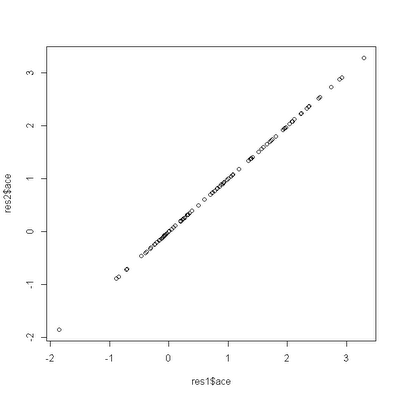 Then, I will use anc.ML() to estimate internal node states using likelihood, ignoring heterogeneity in the evolutionary rate, and compare these estimates to the "true," normally unknown, ancestral character values. Clearly, the estimates are much closer to the true values in this case. To be perfectly transparent, this particular example is designed to be an extreme case, and for most trees & datasets, the effect will be much smaller. 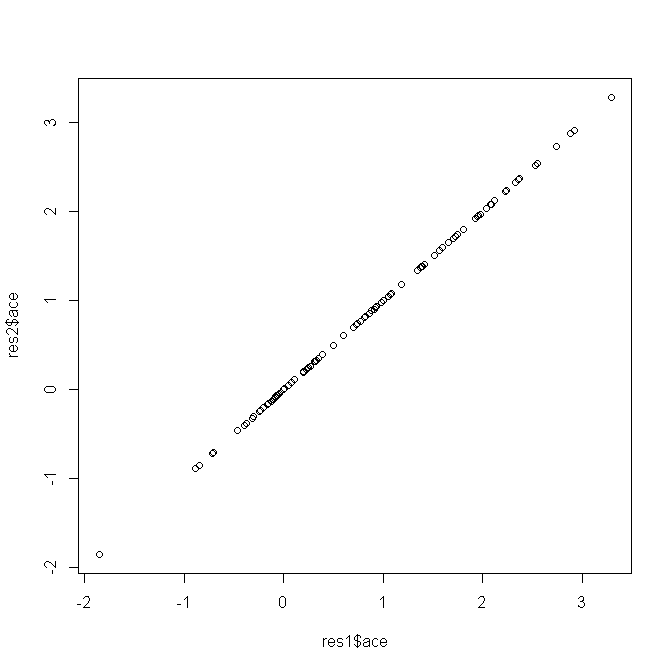 I just posted a new function for ancestral character estimation using likelihood called anc.ML(). (Direct link to code here.) 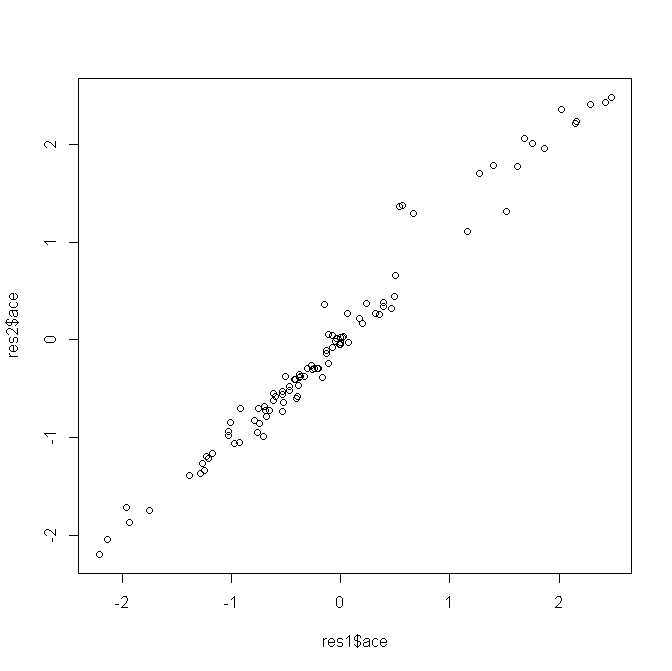 This function is a lightweight version of ace() from the ape package, in that it only does likelihood estimation and only for continuously valued character traits. 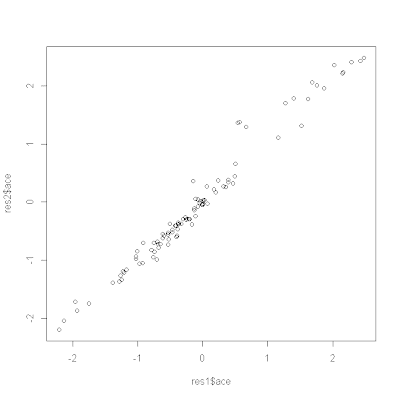 I developed this because I have been having trouble with ace(...,method="ML") in terms of accuracy. 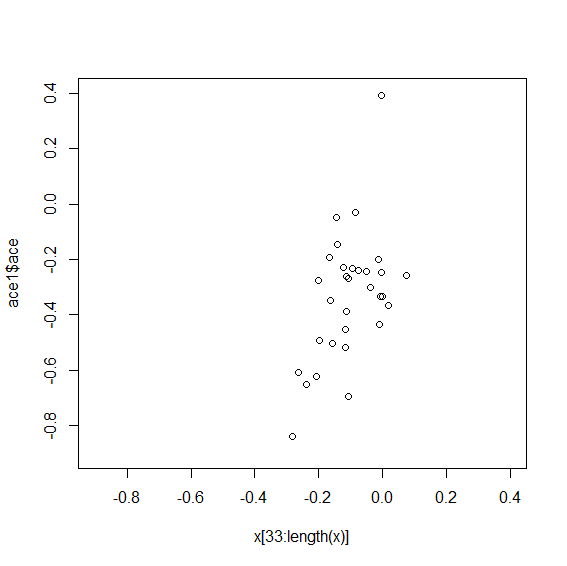 In particular, with some regularity (maybe 5% of the time on stochastic 100 taxon trees), the ML optimization in ace() seems to converge to the wrong ancestral character values. One difficulty that I encountered when trying to evaluate the performance of anc.ML() was the discovery that the likelihoods reported by both functions are different. 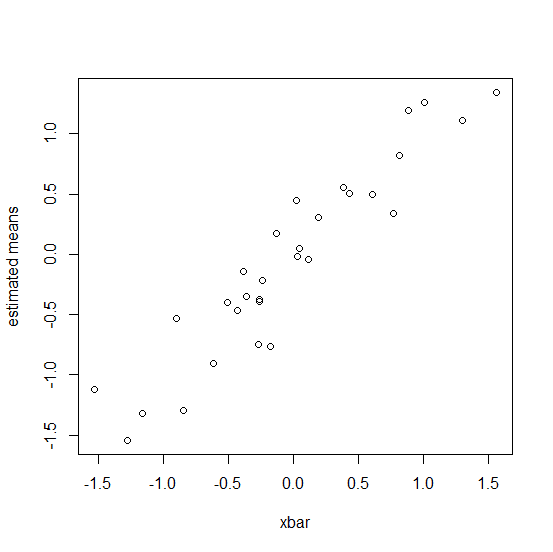 In particular, I realized that the likelihoods reported by ace() exclude constant terms. For a Brownian model, the constant terms for a set of ancestral states and rate for the BM process are two: –(n+m-1)log(2π)/2 (for n species and m internal nodes), and log(|C|)/2 (for cophenetic matrix C). Sure enough, this is exactly the amount by which the log-likelihoods returned by ace(...,method="ML") and anc.ML() differ. Obviously, something is amiss in this example. 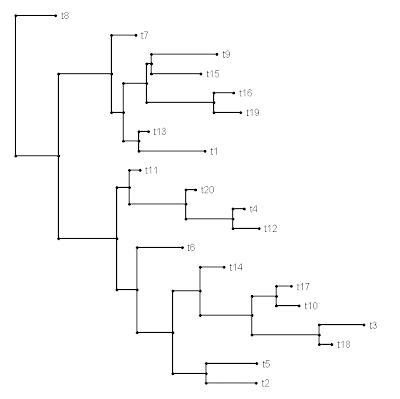 I was working on this to show how to do ancestral state estimation for a continuous trait when rates of evolution differ in different parts of the tree, and I will try to iron out any bugs in anc.ML as I work on this. Following the same theme as an earlier post, I thought I would take a closer look a Google search strings that have led readers to my site. A recent search string that has multiple hits is the following: "drop.tip multiphylo", by which I presume they mean to ask how one drops the same tip (or set of tips) from a set of phylogenies in an object of class "multiPhylo". It turns out that we can do this very easily, in fact. 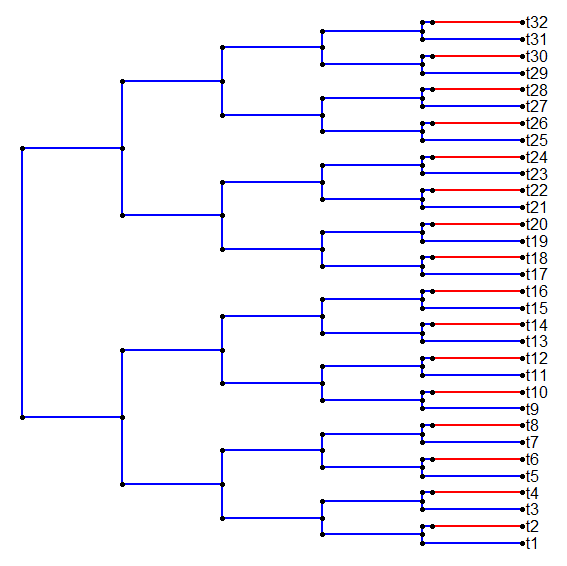 This gives a set of 10 trees, each containing 20 taxa, with the tip labels "t1" to "t20". "t1" "t2" "t3" "t4" "t5" "t6" "t7" "t8" "t9" "t10"
[Thanks to Dan Rabosky for the setdiff() suggestion.] Cool. I can see as administrator of this blog some of the google search terms that lead users to the site. Today, someone ending up on the phytools blog with the following search: "phylogenetic signal k significantly different than one." 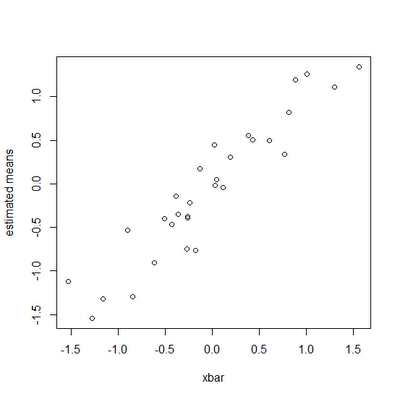 Testing for whether K (Blomberg et al. 2003) is significantly different from 1.0 is not explicitly implemented in my function phylosig(), but it is straightforward to imagine how one would go about doing it with simulation. Ok, now let's contrast this with data generated with no signal.